It is claimed that the Turnberry Hotel on the beautiful, undulating Ayrshire coastline, was the first hotel and golf resort to be built in the world. As is well known, the Scots have for generations been crazy about golf - and proud of its ancient association with the sport - and so it was perfectly sensible that the Marquess of Ailsa decided in 1901 to create a private golf course at Turnberry, part of his own family Culzean Estate. He was a very keen player himself and the Captain of the local Prestwick Club which had been the setting of the first Open in 1860. Travel writer Vivien Devlin has been looking into Turnberry - past and present. Here is her description of this unique resort. The initial development of Turnberry as a recognised Golf course came in 1903 with the building of the Glasgow and South Western Railway link and Turnberry station offered fast, easy access from the city to the seaside. The second phase of this major project was followed three years later by the opening of the Turnberry Hotel, built majestically on the open bluff right above the golf course down near the shore, with its emblematic white lighthouse for all to see from miles around. The setting is unique with a perfect view across the sand dunes and rocky shoreline to the island of Arran, the volcanic `pudding` shape of Ailsa Craig, the long peninsula of the Mull of Kintyre and on a clear day, the coastline of Northern Ireland. 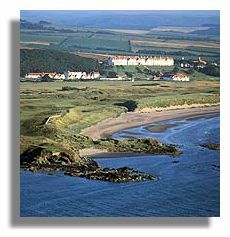 1906 - The Turnberry Resort was born - the first golfing resort of its kind. But just when Turnberry was establishing itself as a first class and popular hotel the First World War broke out. Due to its ideal strategic location on the coast, the property was taken over by the war office as a training station for the Royal Flying Corps with a runway built along the shore. All back to normal by the 1920s, but in 1939 Turnberry was again requisitioned to be used as a military hospital. Runways and hangars were built on the golf courses. In the late 1940s a difficult task was given to Mackenzie Ross to re-design the golf courses out of the derelict landscape of aircraft hangars, brick huts, bunkers, thick layers of concrete and tar macadam runways. 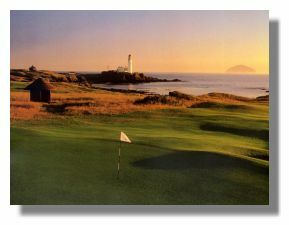 In 1951 the Ailsa course re-opened and Turnberry was back in business. Exactly a century after the golf course was laid out, I set off with my partner Ken in our rented, brand new Mondeo along the M8 West to Glasgow and then due south on the A77 to Kilmarnock and then meandering ever nearer the coast and our destination, Turnberry. (See Ken`s separate road test feature, Getting There). It was a dark, very wet Friday evening, the motorways and roads busy with commuter and weekend traffic and by the time we arrived it was past 8pm. But any thoughts or feelings of the weary traveller dissipated as soon as we turned into the drive. There above us, glistening marble white like the Taj Mahal against the night sky was - what looked like - a giant wedding cake. Beautiful, stunning and utterly romantic. The drive sweeps around the front of the hotel to the reception lobby at the back so that no parked cars spoil the perfect view of the sea from the public rooms and bedrooms at the front. We were welcomed most warmly and our Mondeo taken off our hands by the concierge for valet parking. That's what I call service. We were shown to our spacious "Superior" room on the second floor - unfortunately not overlooking the sea (the hotel was packed due to a wedding the next day and all Ocean View rooms had been booked) - but it was all very comfortable with a small sitting area and huge bathroom with separate power shower as well as a decent sized bath. Bathrobes too and piles of soft white towels on the heated towel rail. This is what we needed after our long journey: a hot soak in the tub, change into something rather elegant and then downstairs for dinner. I tried the pillow test - perfect, soft large pillows and luxurious quality sheets on a giant King size bed. This is another 'unique' aspect to Turnberry - the new signature "Heavenly Bed". A sense of luxury and a good night's sleep guaranteed. Minibars are also being incorporated into all bedrooms as part of a recent major £15 million refurbishment throughout the resort. There are 132 rooms in the hotel itself as well as a fabulous selection of two, six and eight bedroom cottages and lodges, ideal for a family or group of friends who wish a truly home from home environment and privacy. They are particularly ideal for golfers and for corporate hospitality. Unlike typical self-catering holiday cottages, this is five star accommodation with en-suite bedrooms, children's rooms with bunk beds, a lounge with a real fire and a dining room - if you wish to order room service, whether for breakfast, a cocktail party or a private dinner. All meals may also be enjoyed at the hotel. The Turnberry Restaurant has an impeccable reputation for the very best of Scottish cuisine based on the classic French style. When you read that Stewart Cameron, the Executive chef de Cuisine has been at Turnberry for over 20 years, you know that you will be in safe hands. Stewart trained in many fine restaurants across the UK, notably at the Ritz Hotel, London. Over the years he has since trained many a talented chef and his commitment and expertise in teaching has earned him a Lifetime award from the hotel hospitality industry. He is also a member of the Academie Culinaire de France. So keen is he on passing on his skills that he has managed the Ailsa Cooking School for the past four years every November. 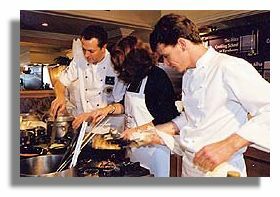 This is a four day residential international course, with guest chefs demonstrating and giving hands-on workshops for up to 40 people. The Head Chef is Colin Watson, who has an international reputation working in Switzerland and the Bahamas, leads a team of no less than 50 chefs in the hotel's three kitchens. Dinner in the Restaurant - with a stunning view out to the ocean and islands beyond - is a formal affair so enjoy the opportunity to dress up and enjoy an evening of sophistication and style. A pianist plays a medley of familiar tunes which adds a relaxed romantic mood. When I asked for a request (As Time Goes By), he courteously declined as he finishes promptly at 10pm - before we had even had our main course, which was rather a shame as the sudden silence after the musical entertainment altered the overall ambience in the restaurant thereafter. Throughout dinner, you will be served by an immaculately dressed army of waiters and we were also looked after with delightful charm by Valentine, a lovely French girl, the Sommelier. There is a set price table d'hote menu offering a good choice for all tastes with the emphasis on the best of Scottish meat, game, fish and fresh local fruit and vegetables. There is also the a la carte menu featuring quality, simple but classic dishes such as Loch Fyne oysters, Dover sole and steak. Everything was beautifully and delicately cooked, presented and served. No wonder the restaurant has won Taste of Scotland awards, AA Rosettes and a 5 star RAC Blue Ribbon for its cuisine. Signature dishes include delicious smooth veloute soups, the finest oak smoked Scottish salmon, a rich seafood broth, Haggis millefeuille, and Medallion of Beef with mushrooms, asparagus, roast garlic, and truffle Madeira sauce. For pudding, a bitter chocolate mousse with a sweet sherry jus or a selection from the wonderful cheese trolley. After dinner we adjourned to the intimate little cocktail bar along the corridor for coffee and a night cap. This was the perfect end to a lovely evening. 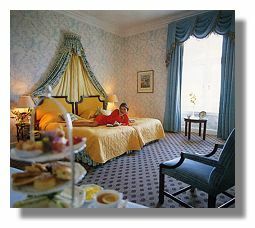 Our drive from Edinburgh seemed a long time ago, quite settled were we now at Turnberry and ready for a good night's sleep. A fabulous breakfast is also served in the main dining room, with a central buffet, laden with every conceivable item you would wish for - juices, fresh and dries fruits, yoghurt, cereals, porridge, rolls, croissants, pastries, cheeses, cold meats and smoked salmon. Then of course hot dishes featuring eggs, kippers, bacon and black pudding, however you wish them cooked and prepared to order. After the superb dinner the night before it is a wonder that people are digging into scrambled eggs but with a day ahead out into the fresh sea air, a round of golf or a swim at the Spa, guests certainly enjoy their breakfast. Lunch is served in the Terrace Brasserie which is upstairs in the state-of-the art Spa pavilion adjacent to the hotel. In total contrast to the traditional Scottish dinner menu, here you will find a delicious selection of light Mediterranean meals, pasta, risotto and salads, served in a casual setting. On warm summer days you can sit out on the Deck lounge, with views across to Ailsa Craig. In the middle of the day most golfers will no doubt be down on the links heading for the 18th green. The Clubhouse serves hearty food and sandwiches for the energetic sporting people in the Tappie Toorie Grill - open to golfers and spectators. Next page > Golf Courses and Activities > Page 1, 2.